Bringing back the beautiful tradition of home death care and memorial services in your private home setting. ​Family centered home funeral and after death care is a form of home vigil for your loved one, much like a traditional wake. 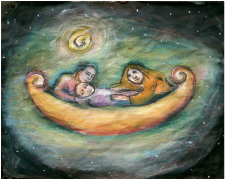 It is a sensitive and compassionate process where family and community members, children as well as elders, can be as involved as they want to be in caring for their loved one's body while​ honoring one's own family traditions and spirituality. This form of Family directed Home Funeral is profoundly beautiful and healing and has the possibility of impacting everyone's attitude about death for generations to come. Let's have step by step discussion about what you want for your own after death care, or care of a loved one. We also offer in-home individualized care plans for you and your loved ones to discuss options together - let's talk more! Akhila and Nandi, Death-Care Midwives assist in Home Funeral care at a residential care facility. "Home" Funerals can happen in hospitals and care facilities. Loving after-death care creates a sacred environment where family and community may gather to offer loving care and ceremony. 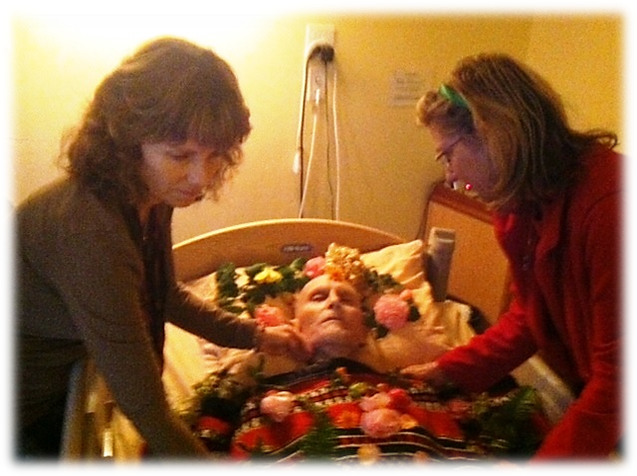 Education by trained Death Doula/Death Care Midwife in body preparation (bathing, use of essential oils and dressing) for lying in honor, for in home vigil in your home or care facility. Assistance in preservation (procuring, delivery, placement and daily maintenance of dry ice).